There were rods propped up down length the bridge and we had lines in the water. This fish was running sideways along the bridge. I woke Miciah up from his beauty sleep and he assisted by reeling up all the lines and providing me with extra light. The fish then ran away from the bridge and took 150 yards of line. Of course, as Murphy's Law would have it, the fish hit the lightest of my three shark rods - a Tsunami Inshore Kayak rod rated for 15-25lb and the Baitrunner 4500. I had 50lb braid on the reel, but with the lighter rod, it was more difficult to turn the fish. Finally, I had the fish by the bridge again before it made a second run toward the boat channel. I was afraid it would run into the pilings but the fish played nice...just for a moment. When the fish was beside the bridge again, we could see deep colour and it looked like a big Nurse Shark! 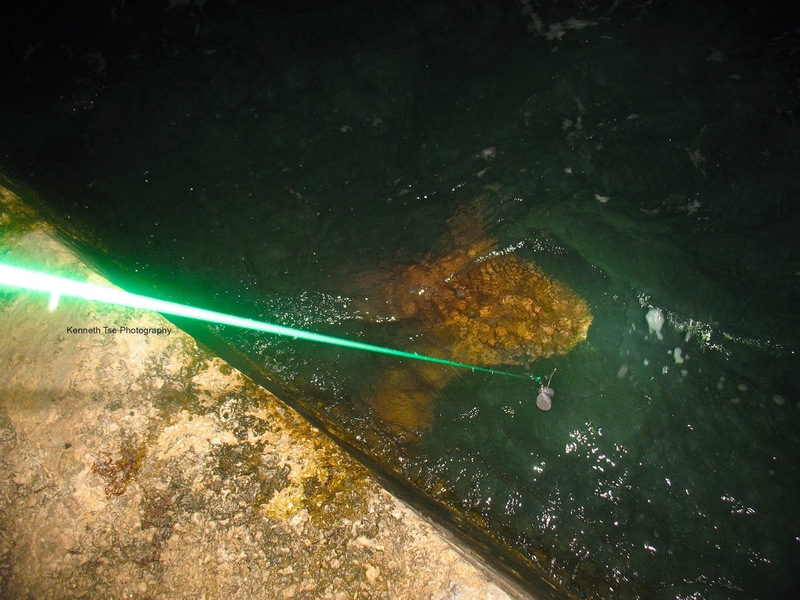 The shark would not give up just yet and so it went right under one of the bridge arches. My 60lb topshot was rubbing against the concrete of the arch as the shark slowly tried to pull in further under the bridge. My rod was too light and I feared it would snap, so I lighten the drag just enough to let it slip if necessary, but palmed it to stop the shark from pulling further into the bridge. I could not gain any line but the shark was slowly taking line inches by inches. With every bit of line given, the 60lb mono rubbed a little more. It would almost be better if the shark had just sat in place so that the line would not rub. It was losing so much topshot that my mono-to-braid knot was just 3 feet from the concrete corner of the arch. Now I really had to try stopping it. And so the stalemate began. I could not let it gain line but yet I could not let the rod take too much pressure in fear of snapping it. For about 15 minutes I was hunched over the side of the bridge holding on - trying to be patient, trying to wait it out, trying to keep the shark from going into the braid. Eventually, patience won out! The shark slowly moved forward, and I gained line bit by bit, until the shark decided to swim out completely! It tried to head for the piling again but I turned it just in time. I think it was at about this time that Ben, Ruoxi and Michael returned. The entire time, Miciah tried to get some pictures of the shark but the camera flash was just too weak. Ben brought out his flood light and Miciah finally was able to get a decent shot of the shark with the fish circling by the bridge. I had reeled the fish all the way up to the 150lb leader and the swivel so I can officially count it as a legit catch! We debated how to land this 7' long Nurse Shark. We were definitely not roping the shark again from the bridge. The only option was to walk the shark 2000 feet back to shore. We knew that, at the base of the bridge, there was a steep wall on the Gulf side and a rocky but shallow shore on the Atlantic side. At the time, it appeared more feasible to beach the shark on the Atlantic side so we picked to go in that direction. However, the tide was moving from Atlantic to Gulf, which was bad news since it gave the shark the advantage to run under the bridge whenever it regained a bit of strength. The shark took every opportunity and ran under the arches 3 times. Each time, I was able to pull the shark out again. I had only walked the shark about 400 feet when the shark went under an arch one last time. This time, it refused to come out and I was locked in a stalemate again. The shark finally pulled back a little and found a weak spot in my 60lb mono. At this point, my whole body was aching. My arms and hamstrings were overextended while hunched over the bridge. I'm a little guy so it was very difficult for me to reach over the side. But having landed that fish, I did wanted more so the lines went out again. Michael tossed out his shark rods as well. An hour later, Michael's big rod was hit. By the sound of it, it was another Nurse Shark on the line. This shark didn't run as far or as long. In fact, after a rather short fight, Michael seemed to have full control of the fish. We got a look and it was another big Nurse Shark about the same size as mine. The shark fought on the Gulf side of the bridge and Michael wanted to walk it all the way back to shore. Since my attempt was fruitless, Ben and Ruoxi wished us good luck and they decided to settled into bed at 1am, and they left Michael and I the task to rope the fish alone...if we can successfully walk it back. 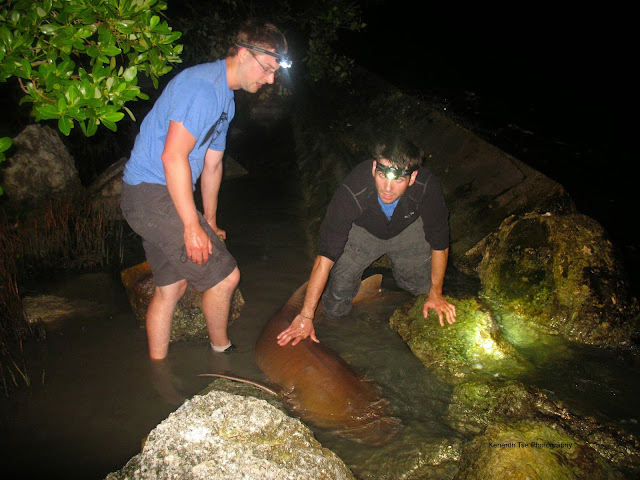 By the time stamp on my photos, we started walking the shark back at around 1:05am. We actually made pretty good progress since we were about 100 feet from the base of the bridge by about 1:30am. That was when trouble struck. The shark went under the second last bridge arch to shore. Michael was hunched over trying to keep his line from rubbing. This was exactly how I looked just an hour and a half ago. We were surprised when Ben and Ruoxi showed up. It was good that they were on hand since we would need every bit of their help if Michael could get the shark out. I gave Michael my experience and told him to simply hold on. The shark will eventually come out. Minutes ticked by...five, ten, fifteen...twenty. The shark sat there. We then had a brilliant idea. Michael had an advantage that was not afford to me. 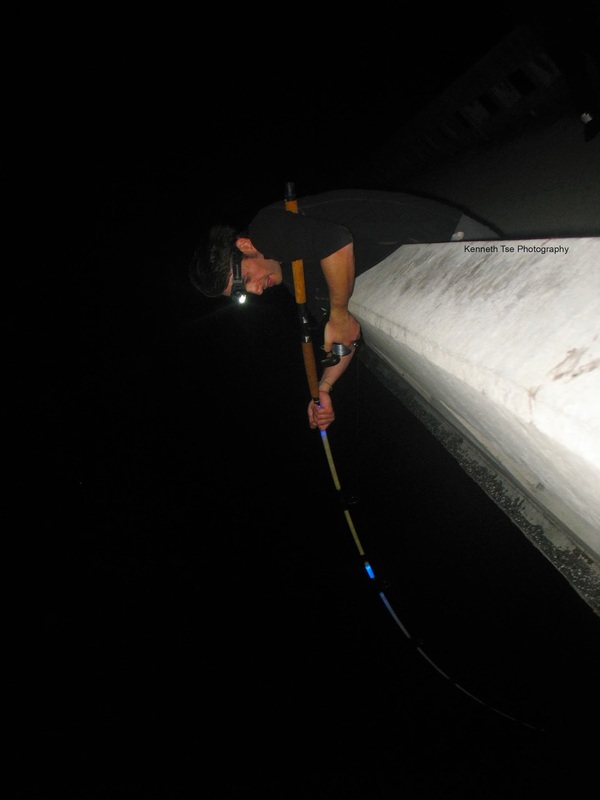 He gave the fish slack and walked to the base of the bridge and onto the steep wall. By doing so, he changed the line angle and now the line was not rubbing against the arch. In fact, if he pulled hard enough, he could possible drag the shark out. He tried to pump the rod as much as possible. I gave him a friendly reminder to make sure the rod was pulled over his shoulder off to the side in case the line snap. If the rod was pulled straight back toward his face, the rod could recoil with tremendous force directly into his forehead. I've heard stories of people fracturing their skull when the line snapped and the rod cracked right over their forehead. Pulling with all his might with his arms, the shark simply didn't move an inch. I suggested to Michael that he could try to shoulder the rod and walked against the shark. This would put the work on his body core, especially the back, to give him more pulling power. From experience, this was how Hawaiians free their stuck lead when they slide bait. The only requirement was for me to watch for a flying lead and warn Michael if the line snapped, especially since he would have his back against the shark. By pulling against the shark with his whole body, the shark finally budged! It came out from under the bridge and in no time, we had the shark against the wall. Now the task began. 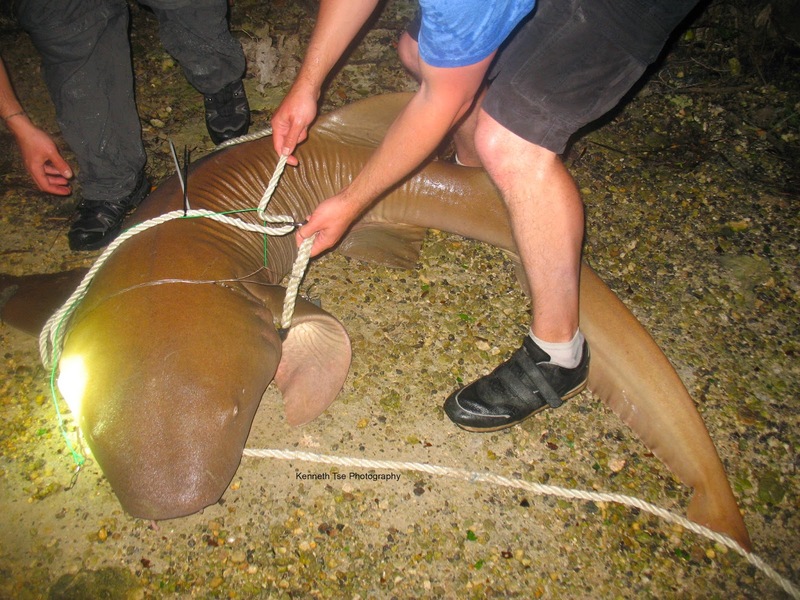 We wanted to lasso the shark with a thick rope behind the pectoral fin so we could lead it over a break in the wall. Ben leadered the shark while I held the loop open waiting for the right moment to slip it over the head. Ruoxi made sure to keep the spotlight on the shark so we would have a good view of it at all time. It took quite a few tries - I had the rope over the head but the shark would shake its head and the loop slid off again and again. At long last, the perfect moment happened and the shark turned its body into the loop. 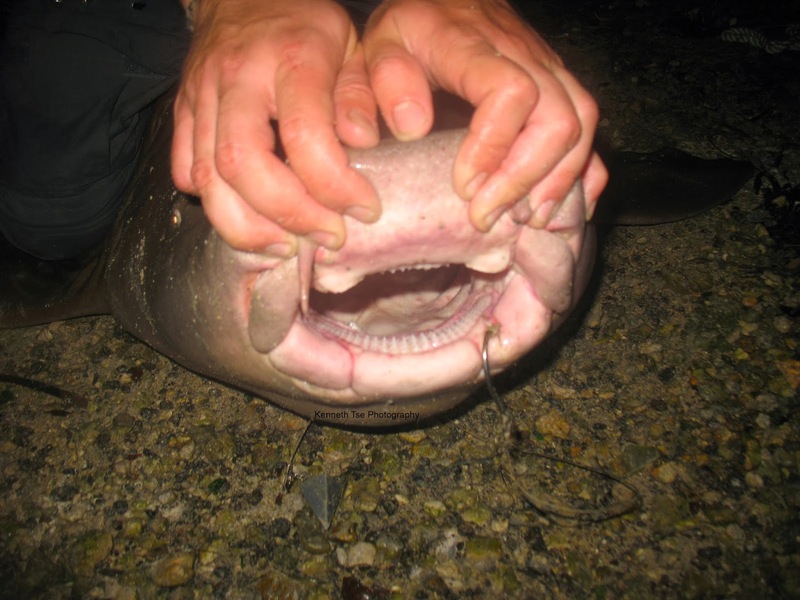 One of its pectoral fins slipped over the loop and I pulled tight immediately. 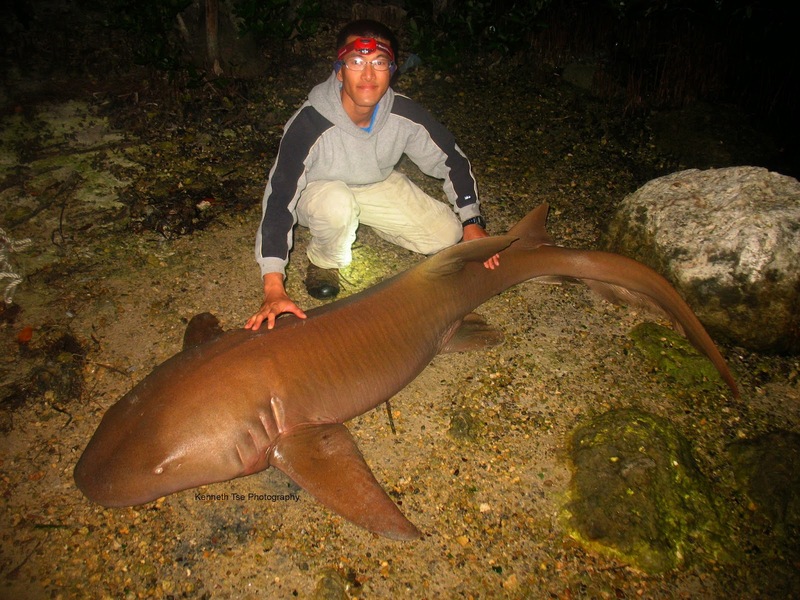 Now imagine a 5'2", 100lb guy trying to hold a 7', 200lb shark with a short length of rope on wet concrete. It was rather dangerous. Knowing my own strength, I told Ben to grab the rope instead while I back him up behind. We walked the shark over to the break in the wall. 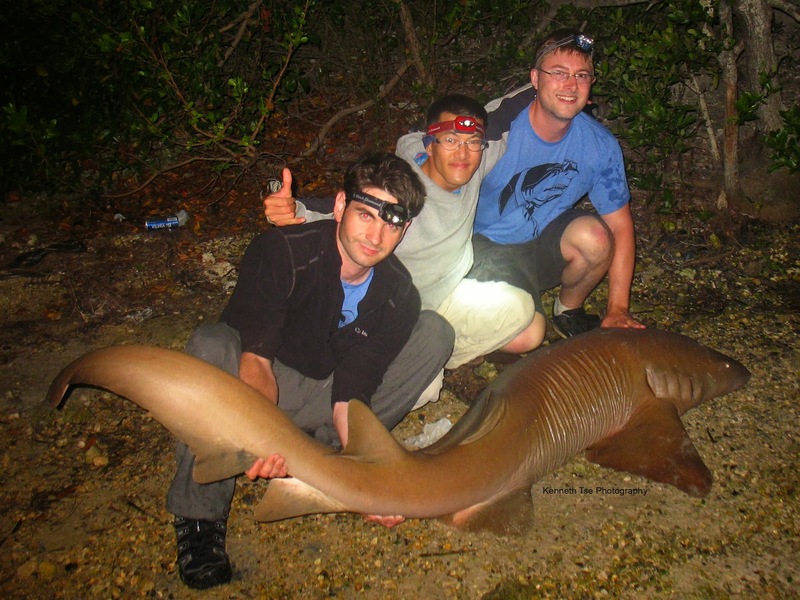 Michael and I grabbed hold of the rope while Ben grabbed the shark behind the pectoral fin. We wanted to lift the shark over the rocks and concrete instead of dragging it to minimize hurting the shark. 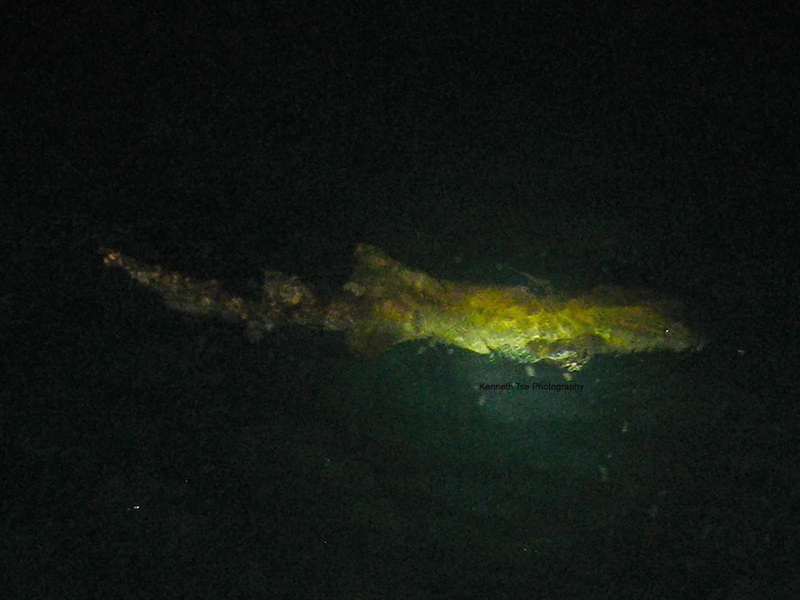 With a lot of grunting, huffing and puffing, we had the shark over the wall in shallow water. That's when we erupted in a loud cheer. The shark had spun enough while we pull it over the wall that the hook came out and the leader was completely tangled in the rope. As we cut away the leader to quickly unwrap it, we saw something else. Wait a minute...what was that? I kid you not...that was my hook and my rig still attached to the shark. That was unreal! It now became so clear why Michael had the shark under control so quickly and he was able to lead the shark with ease. It fought two persons back-to-back within the hour! Sharking is a team event. None of us could landed it alone. From left to right - Michael, myself and Ben. 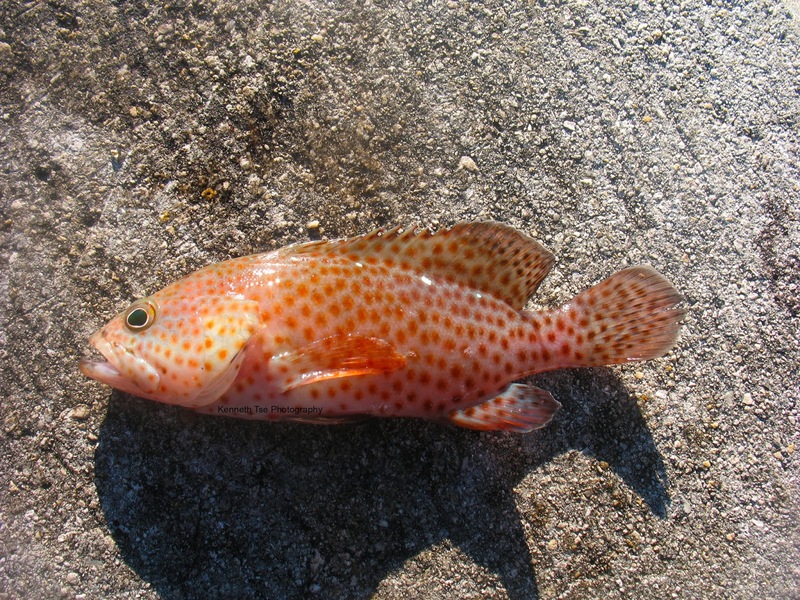 Here's a picture during its release. You can see the shallow pool where we kept the shark until we were ready for pictures, and the break in the wall that we allowed us to pull the shark over the wall. We walked back to the bridge victorious. Hoping for more action, all the rods went out again, but we were really to tired to stay awake. Michael and I fell asleep on the camp chair beside the rods. Right around 5am, I was woken up by a loud bang that sounded like a rod had fell over. I looked around and it appeared that all the rods were good and well so I went back to sleep. A while later, Michael woke me up saying one of his rod had been completely spooled and it was lying on the floor. I guess that was what I heard. Michael was lucky the rod hadn't fly over the rail. We checked all the shark rods and recast them again. Then it was time to fish the sabiki. 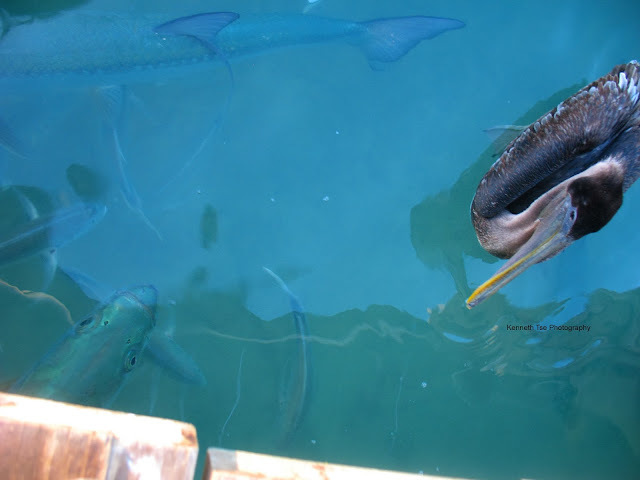 Among all the other reef fish, I hooked a blue coloured parrotfish that came off just as we attempted to net it. Catching a Blue Parrotfish was very high on my list on this trip and it really bummed me for a long time. At the end of the morning, I caught a juvenile Graysby as a consolation lifer. By early afternoon, we packed up and bidded farewell to Miciah. 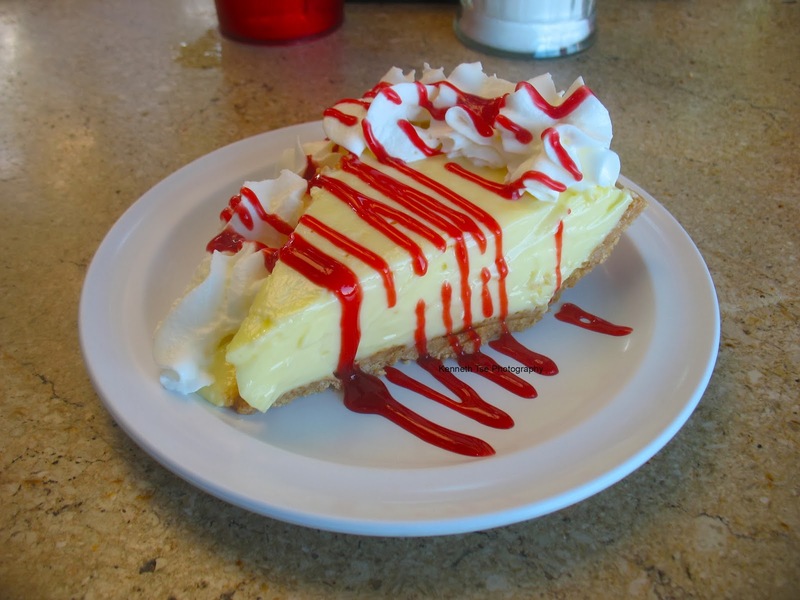 We headed to Robbie's of Islamorada for lunch and a slice of key lime pie. I didn't like the raspberry sauce on the pie. It overpowered the flavour of key lime. Looked great...but tasted so-so...it was much better when served without the raspberry sauce. Ben treated us all to lunch. Thanks Ben! 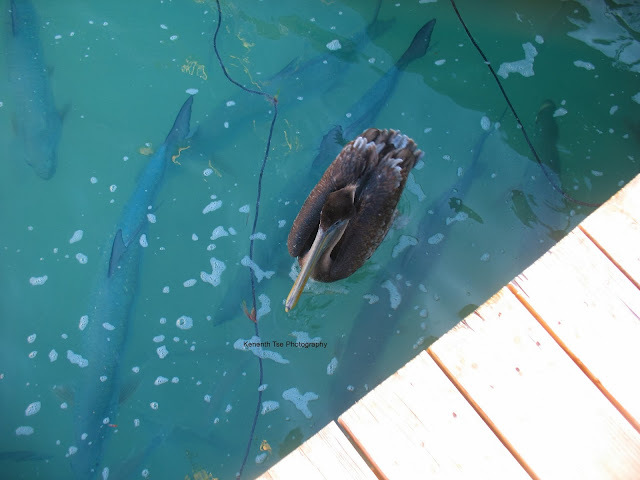 Of course we checked out the tarpon at Robbies! 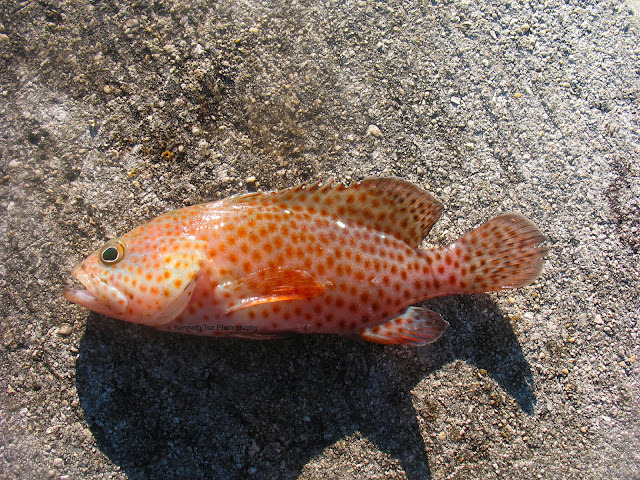 There was a massive one hiding under the dock. Just look at the size of that head compared to the pelican! We arrived at our motel in Florida City just before dark. We went to bed early as we had a long night previously and we had a long day ahead of us.